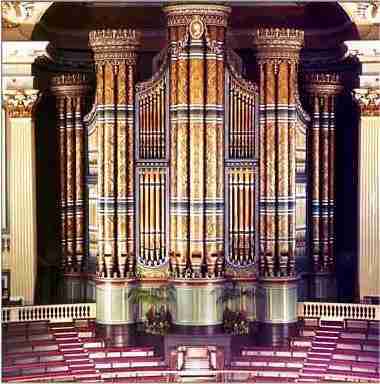 William Hill built his pioneering instrument at Birmingham Town Hall between about 1833 and 1837, but continued to work on it for some time thereafter. It had four manuals and pedals; the Solo Organ was ingeniously borrowed from ranks on the Swell and Choir, and the Pedal had no less than three full-length 32' stops, one displayed in the impressive case-front. The Tuba Mirabilis, installed in 1837, was said to be the first ever heavy-pressure solo reed stop. In 1890 Thomas Hill rebuilt the organ as a conventional four-manual, retaining most of the original pipework but replacing many of the chorus reeds. In 1933 Henry Willis carried out a major rebuilding, increasing the Choir and Solo sections to almost twice their original size, and raising the wind-pressures - in some cases to three times their original level! Every available space was filled, and the organ became a nightmare to tune and maintain. During the 1983 reconstruction, the Willis additions were stripped away, and the interior of the organ brought back to an orderly and manageable layout. For the first time, virtually all of the enormous Pedal organ was divided in the traditional manner on slider chests. The only borrowing was that of the new Bombardon 32' from the Ophicleide. 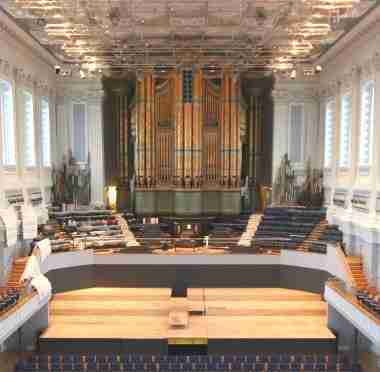 In 1996, Birmingham Town Hall was closed in anticipation of extensive refurbishment which was largely completed in 2007 after which work on the organ was anticipated. Before commencement of the work, but after the interior of the hall had been stripped of all carpet and soft seating, an assessment of the instrument was undertaken to decide what changes might be effected. The removal of the considerable amount of sound absorbing surfaces had a dramatic and quite unexpected effect on the sound on the organ. All the people undertaking the assessment were utterly astonished by the improvement in the sound of the instrument, the reeds in particular. This had two effects. Firstly, it changed the perception of the organ and modified the plans for its "improvement" slightly. Secondly, it convinced all present that no effort was to be spared in convincing the authorities that everything had to be done to preserve what was now a fine acoustic. Whilst the final result is not quite as dramatic as the empty hall was, it is improved out of all recognition. 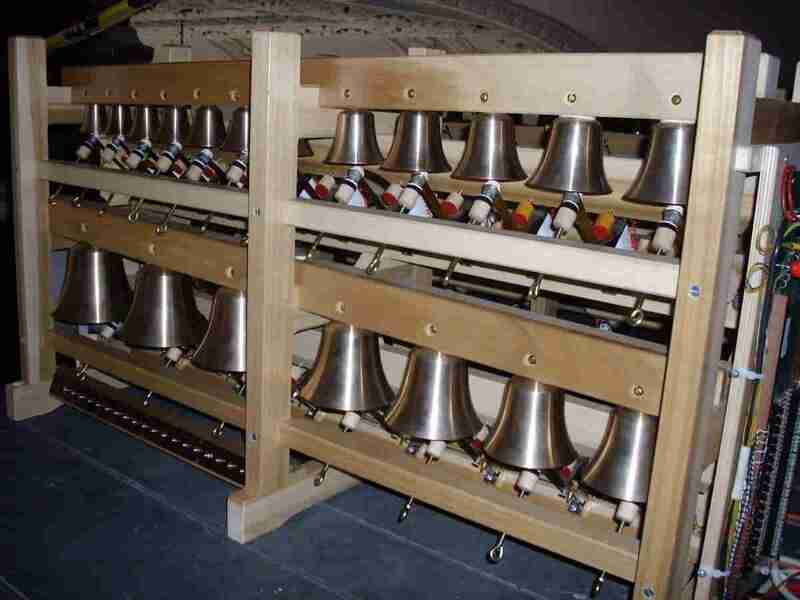 As part of the more recent work, bells were added to the organ. The original specification when the organ was built by William Hill included a set of bells, but no record remains as to what form these bells took. We obtained a set of handbells from the Whitechapel Bell Foundry and set them in a frame with hammers activated by electric solenoids with dampers for the larger bells, which have been well received.